Herbert Whone started learning how to play the violin at an early age and by the time he left school, he was awarded a county scholarship to the Royal Manchester College of Music, where he studied the violin under Henry Holst. After three years’ war service in the RAF he concluded three more years’ study at Manchester University and was awarded the College ARMCM, along with the university’s Mus.B.Hons. 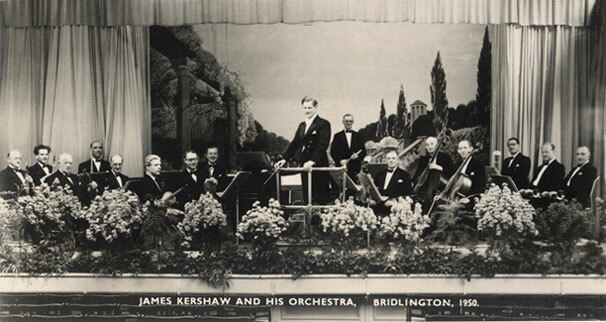 His first professional job was as leader of the Summer Season Orchestra at Bridlington (pictured below). They were years broken by study of the violin in Paris. Following this he joined the Covent Garden Orchestra (one year) and subsequently the BBC Symphony Orchestra (three years). After leaving the BBC Symphony Orchestra Herbert Whone joined the Scottish National Orchestra in Glasgow, where he remained for nine years, seven of which as Deputy Leader. After nine years in the SNO he considered a new direction based on teaching, and despite his reputation as player and artist he took a teaching job in the music department of what was then the Huddersfield Polytechnic. In so doing he returned to home ground and opened up a daily contact with teaching and the problems thereof. The dealing with such problems led to the writing of a book entitled The Simplicity of Playing the Violin (Victor Gollancz, date), in which he sought to get to the root principles lying behind so-called technique – a scheme of simple principles without which the superstructure of technique and the systems of ordinary teaching manuals founder. Two other books followed this one, also from Gollancz – The Hidden Face of Music and The Integrated Violinist, a follow-up to the first book on the violin. During the time of writing these books Herbert Whone was leader for twelve years of the Guildhall Orchestra in York. He also gave teaching demonstrations based on the ideas in the books, mainly to groups of students and teachers, frequently for ESTA. He lectured music at Huddersfield Polytechnic until his retirement when he continued to teach the violin privately at his home in Harrogate.